The Transport for Canberra Policy (PDF 5.8MB) sets the scene and vision for a sustainable city. It was released on 19 March 2012, and provides a foundation for transport planning for the next 20 years. It replaced the 2004 Sustainable Transport Plan and sits alongside the ACT Planning Strategy. improve links throughout the region. 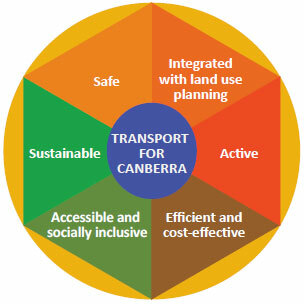 Transport for Canberra was developed in conjunction with the ACT Planning Strategy so the relationship between land use and transport could be considered as we shift to a more sustainable Canberra. The Transport for Canberra Report Card (PDF 4.8MB), released in September 2014, shows significant progress in all aspects of Transport for Canberra. View the Transport for Canberra Overview (PDF 841KB) for a summary of achievements.